With forward or rear-facing seat. DescriptionWith it forward- or rear-facing seat, the Graco Evo stroller will suit all children, new-born or toddler. Fully padded, reversible seat. Forward- or rear-facing. Three position recline to lie flat. Suitable from birth till 3-year old (max 15 kgs). Some parents have asked for a rear-facing stroller to rent in Paris. We've selected this Graco Evo pram for its ease to use and its confortable seat and driving. With its reversible padded seat, your child and yourselft will enjoy walks in Paris. 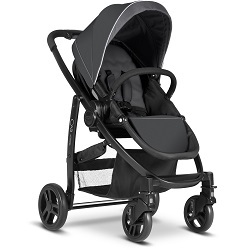 With its lightweight and compact chassis, one-hand folding, this is an ideal city stroller. Such a great idea for making people's trips to Paris easier with kids! Highly recommended! Excellent product and service! The stoller we rented was as expected and invaluable in our stay. Communication with staff was excellent. I would definitely recommend and use again. Thanks for making our stay in Paris better!